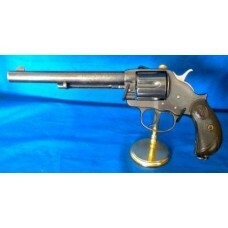 This Category includes Antique Black Powder Colt Revolvers. These Firearms are offered on a commission sale basis and are NOT kept at our address. Please E mail us for details of the owner. A COLLECTORS LICENCE IS REQUIRED FOR CARTRIDGE REVOLVERS. Colt DA Lightning. Model 1877. Caliber 38.Colt Lightning Double Action 1877 Model Cal.38..
Colt DA 1878 Frontier Six Shooter Caliber 44/40Colt DA 1878 Frontier Six Shoot..